Athletics’ dysfunctional marriage: can injury prevention be reconciled with performance training? Show me a runner. You’re showing me someone who’s run through pain. Isn’t that true? When you’ve been in the middle of a long run and felt the beginnings of a shin splint, you’re finally in the club. But we can’t stop now! There’s miles to be logged. Our marathon training plan says 60 miles a week, and this long run is 17. We’ve faced with having to ask the dreaded question: should I choose to continue this training, or should I choose to prevent the injury? In a conversation with Kurt Marion, hotshot LMT at P.A.C.E. (Portland Athletic Center for Excellence), it became clear to me that many coaches felt that the advice given to their athletes by physical therapists and other sports rehab experts—stay off that leg; don’t play for two weeks—were in direct conflict with their goals of developing their athletes to be better performers. In practice, many people—especially the fitness enthusiast—run through pain for weeks at a time, until an injury “blindsides” them. Many coaches push their athletes to do the same. Ignoring our better judgment, we become sabotaged by our own perseverance. (The prevalence of a wide variety of exercise-related diseases, such as rhabdomyolysis, hypergymnasia and the female athlete triad, are strong examples of this trend). In Critical Chain, Eli Goldratt explains how, in human systems, there often seem to be irreconcilable differences between two different objectives. 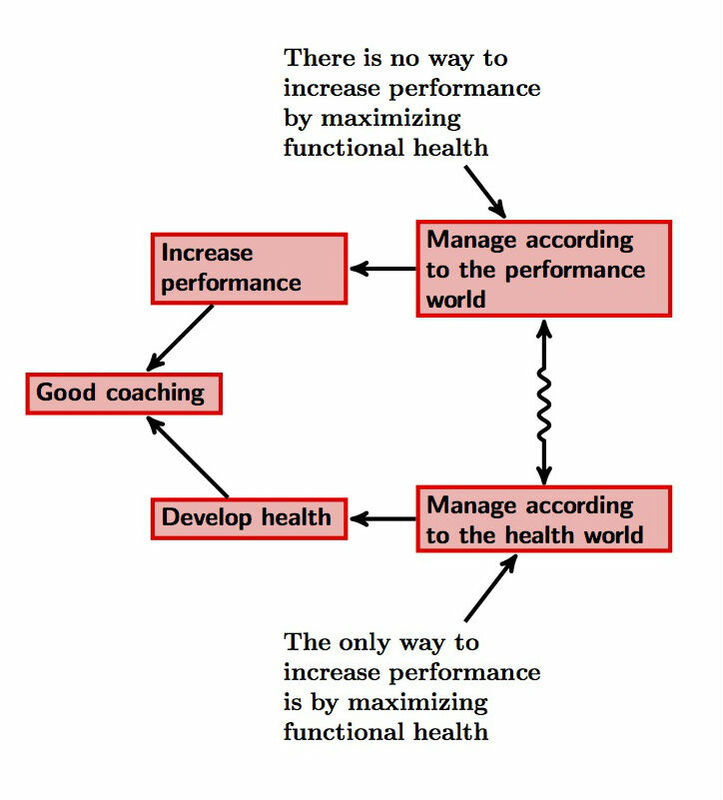 Going back to athletics, we can understand this as a conflict between philosophies: health professionals think that health is the foundation to athletic performance, while most coaches and athletes don’t believe that the way to increase performance is to increase health. By Goldratt’s definition, the conflict between injury prevention and training is really up in our heads. The statistics of exercise-related injuries certainly seem to corroborate this: 30 to 90% of all running injuries result in a reduction in training. There is plenty of other anecdotal evidence that supports this: Alberto Salazar, elite disance runner turned elite coach, overtrained chronically until he basically destroyed his athletic ability. Today, he takes pains to protect his athletes from overtraining and injury—and they are raking in the medals. The reason why we don’t do this is because of the athletic culture we have fostered. Some of the fastest-growing sports and races—CrossFit, Tough Mudder, Spartan Race, and even marathons—all value training volume and performance over health. We count miles instead of healthy miles. Goldratt finds that the very same problem exists in business management culture. Suppose that the “weakest link” in a production chain can only produce ten units, and all other links can produce twenty. Business culture, which values local performance, pressures every link to perform at maximum. However, because the weakest link—say, sales—can only sell ten units per hour, this means that every hour, ten more finished units are being stored into the warehouse. The company is losing money like crazy. Think of it this way: when your thighs can run twenty miles but your shins can only run five, you’re faced with a “choice”: Do you run twenty, or do you run five? In a very real way, the weak link in this system is your shins. This means that the entire system is predicated on the functioning of your shins, and can only go as hard or fast as your shins can. You ran too far. You’re injured. You’re out. Do the math. To train for that marathon, you were supposed to run 60 miles a week for 6 months: 1440 miles total, give or take. You had a stress fracture 2 months in, that laid you off for another two months. After 4 months, you’ve only run for two months—that’s only 480 miles. You’d have to double your mileage for the last two months—run 120 miles a week—in order to complete your allotment. The choice between health and performance isn’t really a choice. The only way to develop performance is to develop health. Alberto Salazar knows that. It’s time the rest of us—coaches and athletes—took the hint. Previous Post(Not) running quote of the dayNext PostPlease, leave your robotic performance-enhancing devices at the starting line. totally agree , developing health becomes first , and we have to be conscious about that. Great! This drives my own practice – I began to realise that every time an athlete of mine visits a physio or other health professional then our program has been a failure. The biggest challenge is being able to ‘invade’ the athlete’s life deeply enough to help remove all the causes of potential injury (chemical, biomechanical etc.) which takes time and trust and is particularly difficult via online coaching. But I completely agree – as coaches we need to be the main injury preventers – the current status quo needs to be replaced by one where good coaches are the first port of call to fix injury and only a few very rare and serious cases are ‘referred onwards’ and not as currently where it’s basically part of most athlete’s annual budget to go to the physio a few times.